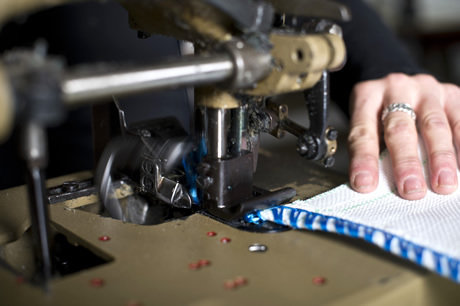 Sackmaker are the longest established sack manufacturer in the UK. Back in 1915 when John & Hugh Dickson started making hessian sandbags for the war effort, little did they know they were starting a company which would survive 3 generations and still be going strong nearly 100 years later. Things, of course, have changed over the century with Hessian & Jute sacks largely being replaced with woven polypropylene - but Sackmaker still remain committed to providing a manufacturing service in the UK. • Pallet covers & cage/bin liners. Prototypes - samples - trial orders and "just in time" manufacturing - your ideas turned into reality. 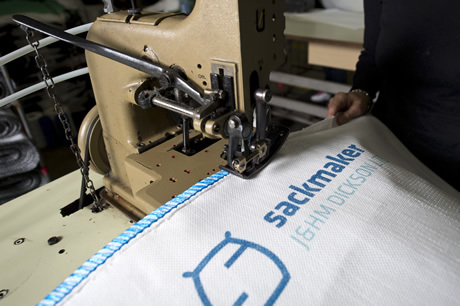 Sackmaker are the oldest manufacturer of sacks in the UK. Established nearly 100 years ago to manufacture hessian & jute sandbags, J&HM Dickson Ltd developed their sack making capability to supply the growing number of companies needing sacks for nuts, bolts, washers & fasteners which they supplied to heavy industries making machinery and automotive products. Dickson for Sacks, as they were known, also cleaned, refurbished and repaired second hand sacks for resale – these heavy woven hessian, twill and jute sacks had often been imported into the UK containing products such as coffee beans, peanuts, seeds & other dried foodstuffs so in many ways Dickson’s were already recycling sacks years ahead of their time and continue to have the philosophy that manufacturing top quality sacks which can be reused is the way forward. 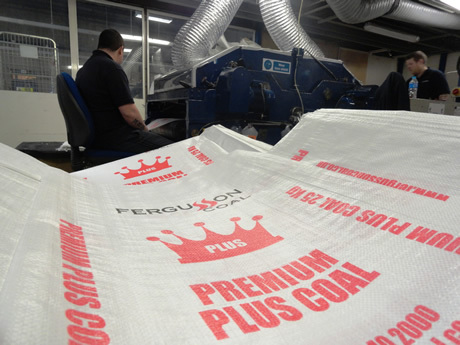 As Hessian products largely died out in the 1970’s, Sackmaker were the first UK sack & bag company to become suppliers of Woven Polypropylene (WPP) Sacks to industrial bag users in the UK. Woven Polyprop material sacks were lighter, stronger & cheaper than the traditional sack alternatives and before long sack maker had helped revolutionise the type of woven sacks still in use today. The strength of the white woven material, sometimes described as white hessian, and developments in mechanically handling systems for bags led to more specialised sacks being made which could carry much higher loads – these FIBC’s (Flexible Intermediate Bulk Containers) also known as Bulk bags or Tonne Sacks have now become an established method of packing & bulk sacks are used all over the world today. Sack makers unique UK bag manufacturer status means not only can we still make Jumbo sacks in the UK but also make woven sacks & bags for a wide variety of specialist sack applications – made to order sacks, bespoke size bags, pallet covers, cage liners, bales, wool sacks, eyeleted sacks, printed sacks, sacks with handles, net sacks - the list just goes on & on!